On the morning of 21.03.2018, around 7 am, a tiny puppy was shot. The shooter was a well-known member of Kennel Club Of Montenegro. His reason for this monstrous crime and animal cruelty was that the puppy was attacking sheep. Please, tell me whether you think an animal knower, dog shows judge and trainer in his right mind could believe that a few months old puppy could attack, be a treat to a sheep? The owner of the pup took the dog to the Veterinary Clinic in Polje, Bar (Montenegro), where the veterinarian, once member of Veterinary Chamber of Montenegro, told him not to press charges and get rid of the dog. Yes, you've read well, he wasn't instructed to treat or humanely euthanize the dog. A well-known and respected vet told the owner to "get rid of the dog" and this poor baby ended up in a ditch. A vet who should be letting the authorities about cases like this one. Luckily, a local animal rescue group was contacted, pup was located and he is fighting for his life. Unfortunately, it is not looking good, but Beban wants to live. Local rescuers are trying to save the legs of this little guy however it seems like one leg needs to be amputated as it has no blood flow anymore. Updates of Beban will be posted here. We know the names of the man who shot the pup and the vet who refused to help Beban. However, to increase the chance justice will be served for Beban, we will not publish their names yet. People are afraid of members of the institutions mentioned above so it looks like, once again, no one will be punished for this crime. If this will be the case, we will publish the names of the shooter and concerning vet and hope justice will still be served. 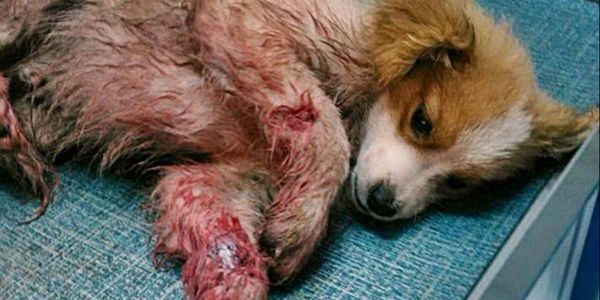 Please sign and share, not only for Beban, but for all dogs who are victims of shootings, poisonings, deliberately car hittings as so far, the individuals who are responsible for these crimes mostly get away with it and thus keep making innocent victims. Needless to say this has to stop! We must demand justice now!